God Emperor of Dune is a science fiction novel by Frank Herbert published in 1981, the fourth in his Dune series of six novels. It was ranked as the number 11 hardcover fiction best seller of 1981 by Publishers Weekly. Leto II Atreides, the God Emperor, has ruled the universe as a tyrant for 3,500 years after becoming a hybrid of human and giant sandworm in Children of Dune. The death of all other sandworms, and his control of the remaining supply of the all-important drug melange, has allowed him to keep civilization under his complete command. Leto has been physically transformed into a worm, retaining only his human face and arms, and though he is now seemingly immortal and invulnerable to harm, he is prone to instinct-driven bouts of violence when provoked to anger. As a result, his rule is one of religious awe and despotic fear. Leto has disbanded the Landsraad to all but a few Great Houses; the remaining powers defer to his authority, although they individually conspire against him in secret. The Fremen have long since lost their identity and military power, and have been replaced as the Imperial army by the Fish Speakers, an all-female army who obey Leto without question. He has rendered the human population into a state of trans-galactic stagnation; space travel is non-existent to most people in his Empire, which he has deliberately kept to a near-medieval level of technological sophistication. All of this he has done in accordance with a prophecy divined through precognition that will establish an enforced peace preventing humanity from destroying itself through aggressive behavior. The desert planet Arrakis has been terraformed into a lush forested biosphere, except for a single section of desert retained by Leto for his Citadel. A string of Duncan Idaho gholas have served Leto over the millennia, and Leto has also fostered the bloodline of his twin sister Ghanima. Her descendant Moneo is Leto's majordomo and closest confidante, while Moneo's daughter Siona has become the leader of an Arrakis-based rebellion against Leto. She steals a set of secret records from his archives, not realizing that he has allowed it. Leto intends to breed Siona with the latest Duncan ghola, but is aware that the ghola, moved by his own morality, may try to assassinate him before this can occur. The Ixians send a new ambassador named Hwi Noree to serve Leto, and though he realizes that she has been specifically designed and trained to ensnare him, he cannot resist falling in love with her. She agrees to marry him. Leto tests Siona by taking her out to the middle of the desert. After improperly using her stillsuit to preserve moisture, dehydration forces her to accept Leto's offer of spice essence from his body to replenish her. Awakened to Leto's prophecy, known as the Golden Path, the experience convinces Siona of the importance of the Golden Path. She remains dedicated to Leto's destruction, and an errant rainstorm demonstrates for her his mortal vulnerability to water. Siona and Idaho overcome a searing mutual hatred of each other to plan an assassination. As Leto's wedding procession to Tuono Village moves across a high bridge over a river, Siona orders one of her Fish Speakers to destroy the support beams with a lasgun. The bridge collapses and Leto's entourage, including Hwi, plunge to their deaths into the river below. Leto's body rends apart in the water; the sandtrout which are part of his body encyst the water and scurry off, while the worm portion burns and disintegrates on the shore. A dying Leto reveals his secret breeding program among the Atreides to produce a human who is invisible to prescient vision. Siona is the finished result, and she and her descendants will retain this ability. He explains that humanity is now free to scatter throughout the universe, never again to face complete destruction. After revealing the location of his secret spice hoard, Leto dies, leaving Duncan and Siona to face the task of managing the empire. In God Emperor of Dune, Frank Herbert analyzes the cyclical patterns of human society, as well as humanity's evolutionary drives. Using his ancestral memories, Leto II has knowledge of the entirety of human history and is able to recall the effects and patterns of tyrannical institutions, from the Babylonian Empire through the Jesuits on ancient Earth, and thus builds an empire existing as a complete nexus encompassing all these methods. This galactic empire differs from the historical tyrants in that it is deliberately designed to end in destruction, and is only instituted in the first place as part of a plan to rescue humanity from an absolute destruction which Leto II has foreseen through his oracular visions. Leto II personally explores the emergent effects of civilization, noting that most hierarchical structures are remnants of evolutionary urges toward safety. Thus, by forming a perfectly safe and stable empire, Leto II delivers a message to be felt throughout history. 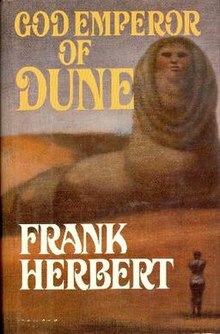 Stylistically, the novel is permeated by quotations from, and speeches by its main character, Leto, to a degree unseen in any of the other Dune novels. In part, this stylistic shift is an artifact of how Herbert wrote it: the first draft was written almost entirely in the first-person narrative voice, only being revised in later drafts to insert more third-person narration of events. This page was last edited on 28 February 2019, at 19:19 (UTC).